The ROS-Industrial Consortium Americas recently completed another successful ROS-I training event April 10-12 at Southwest Research Institute. We had 11 people from a variety of industries complete the Basic and Advanced training material, which covers a variety of topics from creating a ROS node, publishers, subscribers, and using the ROS parameter server. The Advanced training material covered motion planning using Stomp and Descartes, as well as creating a computer vision application using the Point Cloud Library (PCL). On Day 1, the Basic and Advance track groups met separately, but were merged together the remaining days. The training material was cumulative so that by the end of Day 2, participants had a working ROS project that could move a robot to a simulated box location. On Day 3, everyone got to try their hand at a more challenging vision or path planning project. Many were able to complete the challenge and execute it on one of the available robots. 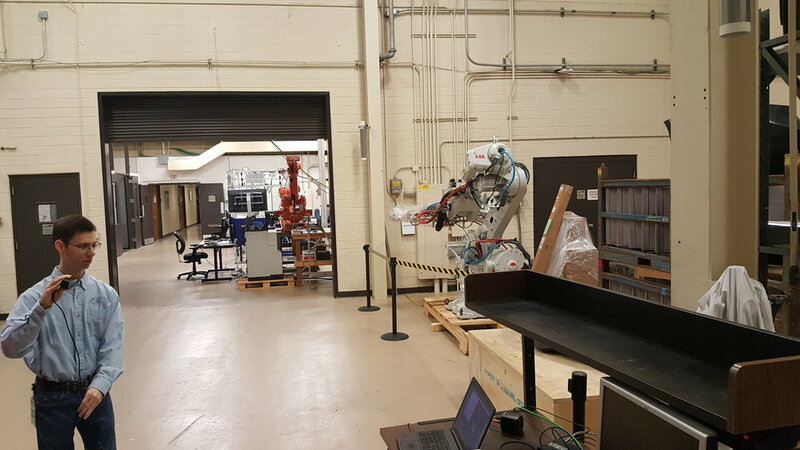 Attendees also got a short tour of SwRI's lab space that included hardware for application testing and development. By request, a subset of attendees requested a breakout session where they were able to see a side-by-side comparison of some of the 3D depth sensors available, as well as a new surface reconstruction technique, taking advantage of the proximity of the lab space and the development hardware available. Thanks to everyone who came and helped make this event great! If you have questions about ROS-Industrial training, please feel free to contact us. Keep an eye out for the next ROS-Industrial Consortium Americas event at the Events page!